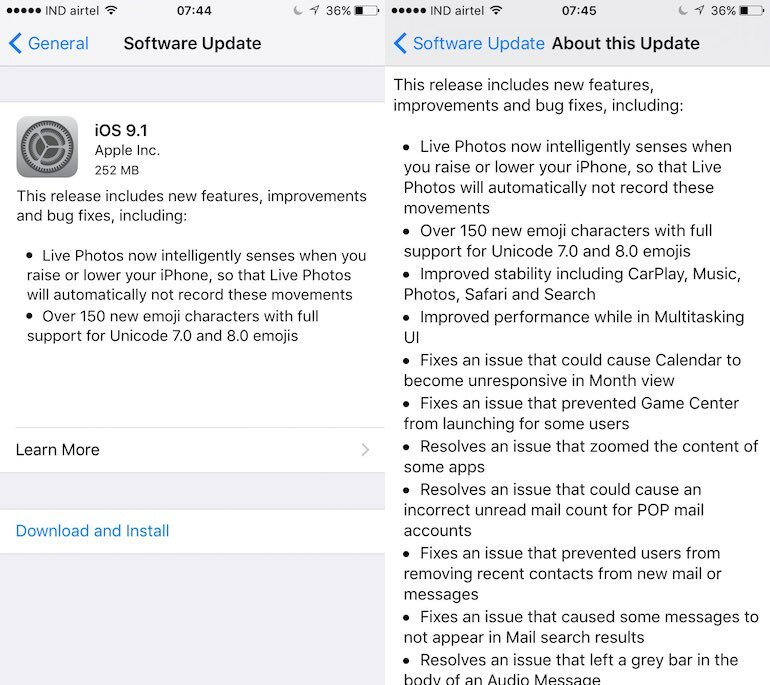 Apple has released the iOS 9.1 and OS 10.11.1 updates for eligible iOS devices and Macs respectively. Apple has also rolled out the watchOS 2.0.1 update to Apple Watch users. iOS 9.1 brings improvements to Live Photos feature introduced in the iPhone 6s and the iPhone 6s Plus, over 150 new emoji characters (including the middle finger), and improved performance in the multi-tasking UI, apart from a host of other bug fixes detailed below. Apple has also detailed the security contents of the watchOS 2.0.1 and iOS 9.1 updates, should you be into that kind of stuff. As always, iOS updates are available over-the-air (OTA) on your device (Settings -> General -> Software Update) as well as via iTunes on your PC or Mac. Apple Watch updates are available via the Apple Watch app on your iPhone, and OS X updates are available via the Updates tab inside the Mac App Store app. We recommend taking a backup of your device before installing any updates.